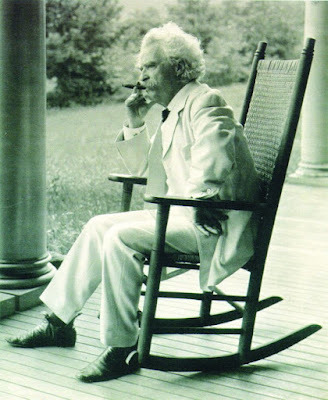 Chris Leadbeater at the Telegraph visits places associated with Mark Twain on his birthday. Few figures in the annals of literature can have generated more words than Mark Twain. If it was not the many works that this fabled giant of letters created during his 74-year lifetime, it was the reams of praise that have come afterwards. Whether or not the man born – and known to his family – as Samuel Langhorne Clemens ranks as the greatest of all American novelists is perhaps an issue that can only be settled by a debate in some celestial bar with the spirits of Ernest Hemingway, F. Scott Fitzgerald and John Steinbeck also in attendance (all of whom might decide that the answer to the question is still on terra firma in the shape of Harper Lee). But there can be no doubt that, over a century on from his death, Twain’s reputation in the literary firmament is still lofty indeed, his most important books – notably The Adventures of Tom Sawyer (1876) and The Adventures of Huckleberry Finn (1884) – still in position as cornerstones of art in the English language.